Being wealthy certainly opens up many doors when it comes to doing something. For example, if you are extremely rich, then going for a holiday offers an abundance of choices as your money can fly you anywhere, letting you stay in the best hotels and sup on the most delectable dishes without worrying about whether you are able to make next month’s mortgage. Well, having said that, the same principle also applies when it comes to your mode of transportation – you have stretch limos, sports cars, private jets, helicopters, yachts, and a new and emerging (pun not intended) category – submarines. Most yachts these days also come with a submarine attached to them – and it is certainly growing in terms of popularity. 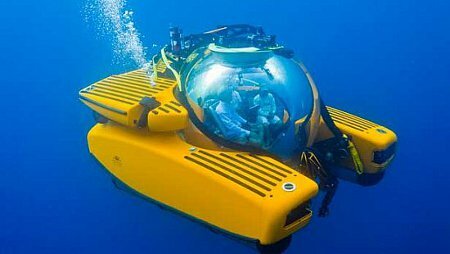 It seems that an anonymous billionaire has decided to pick up one of these puppies as his personal underwater ride, choosing the Triton 3300/3 in the end. The name of the submarine does give the game away somewhat in terms of its performance ability, and also denotes that this is the third of its kind to enter production. What does the Triton 3300/3 submarine offer on paper? Apart from its ability to ferry 3 passengers underwater, it also boasts what some deem to be the largest acrylic transparent dome where the pilot cabinet is concerned. This offers a fantastic 360-degree view of the aquatic life on the outside, and you need not fret about ending up in a watery grave as the transparent dome is strong enough to withstand high pressure. Previous experiments did show that diving to 3,000 feet is not an issue for this yellow submarine, and the entire body shape with its vertical orientation has been uniquely crafted to make sure it can drop to such depths rapidly, while re-emerging at a similar pace as and when required. No idea on how much something like this will cost, but it is definitely expensive to say the least, and those of us who are wage earners can only dream about it, while the uber rich can always settle for different modes of transport.